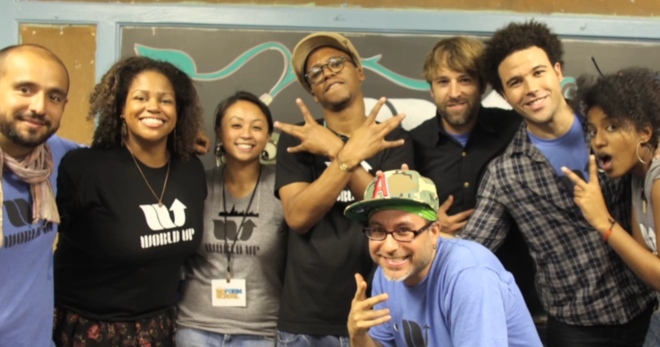 Earlier this year we brought you the tale of World Up, a non-profit organization based in New York that fuses technology and hip hop to educate high school students. Now it’s looking to raise money to help it fund a new semester of classes. World Up has been awarded $25,000 from the Mozilla Foundation’s Hive Digital Learning Network and the John D. and Catherine T. MacArthur Foundation to fund its WU fall semester, which fuses computer programming, beatmaking, rhymes and basic electronics to get the young people involved to produce a WU School app, an album of original tracks, and a series of international collaborations with artists all over the globe. The catch? The funding will only be unlocked when World Up can match it with money raised elsewhere. To this end, the organization has turned to crowdfunding site Indiegogo to raise a further $25,000. If successful, the $50,000 total will be used to deliver the project, pay for computer equipment for the students to use, and to attract ‘top-notch talent in the hip-hop and technology worlds’, Given that previous World Up Projects have involved the likes of Lupe Fiasco and Bajah and the Dry Eye Crew, it’s fair to assume they can deliver on this promise. With 42 days, to go, funding is less than one fifth of the way to its target, so if the story has piqued your interest, watch their video below and click through to donate.